Utopia AutoDesigner is an automated creation of SAP Information Steward (IS) dashboards for Data Migration from SAP Data Services data flows. Utopia created uAutoDesigner in order to automate processes that were manual and time-consuming. SAP Data Services and SAP Information Steward have differences in the syntax used to define rules in each respective tool. Without the automation, it would mean a great deal of rework in order to define dashboards that reflect the logic inside of Data Services. As a result, Utopia has created a translation engine that will automate this task. We provide dashboards that mimic the rules that are used in data migration templates so that the business can monitor and participate more closely during the total data migration process. Extracting rules from Data Services data flows and converts that to Information Steward rules. Automatically generates rules and dashboards that correspond exactly to the technical rules in Data Services. 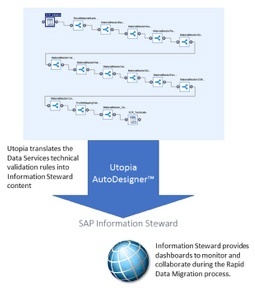 Utopia AutoDesigner creates IS code directly from the SAP Rapid Data Migration templates to emulate the technical aspects of the project in a visual presentation for the data owners and project sponsors. The dashboard mimics each segment of data to be migrated and shows the readiness of the migration team to be able to load data into your new SAP system. Better data migration accelerators within the Rapid Data Migration (RDM) and Data Migration Content Extensions areas, are specifically engineered for each project, to speed time to migrate, reduce effort and improve quality. It enables the business or data owners the ability to be part of the data migration process and to monitor progress without interaction with a busy IT team. It also creates transparency in the Data Migration process by having real-time updates on progress or issues.